D.C. Judge Tells Furloughed Workers They Must Stay On The Job About 400,000 federal workers are called "excepted" and are required to work without pay. They sued for an injunction that would end that requirement, but the judge said no. Demonstrators protest against the government shutdown in Boston on Friday. "We will continue our fight to rectify what we think is an erroneous decision," O'Duden adds. The workers had sued for a temporary restraining order that would remove the obligation to go to work if they were not being paid. O'Duden says he represents about 150,000 people but seeks relief for about 400,000 federal employees who have been deemed "excepted," meaning they are required to work without pay. In their suit, the plaintiffs claimed that the government has authorized agencies "to require employees to work in a far broader range of circumstances" than the law provides. They wanted that law ruled unconstitutional and for government offices to stop requiring that workers do their jobs without payment. U.S. District Judge Richard J. Leon denied the workers' request for a restraining order that would require the government to pay its employees or allow them to stay home, The Washington Post reports. He reportedly said it would be "profoundly irresponsible" to issue an order that would keep thousands of workers off the job. With his ruling, Leon maintained the status quo. However, he asked for further information from the government and union, O'Duden says. The attorney says the judge will hear additional arguments on Jan. 31. The Department of Justice representing the government has declined NPR's request for comment. The NTEU represents workers at the Internal Revenue Service, U.S. Customs and Border Protection, the Environmental Protection Agency, the National Parks Service and several other offices. The National Air Traffic Controllers Association represents about 24,000 Federal Aviation Administration employees working during the shutdown without pay, The Post reports. "[Judge Leon] indicated that he believed that federal employees would in the end get paid. They may well get paid, or they may not," O'Duden tells NPR. He says although Congress and President Trump have expressed interest in issuing back pay to furloughed workers, "the president, he changes his mind quite a bit, and so I don't think any assumption can be made about if in the end they will get paid." 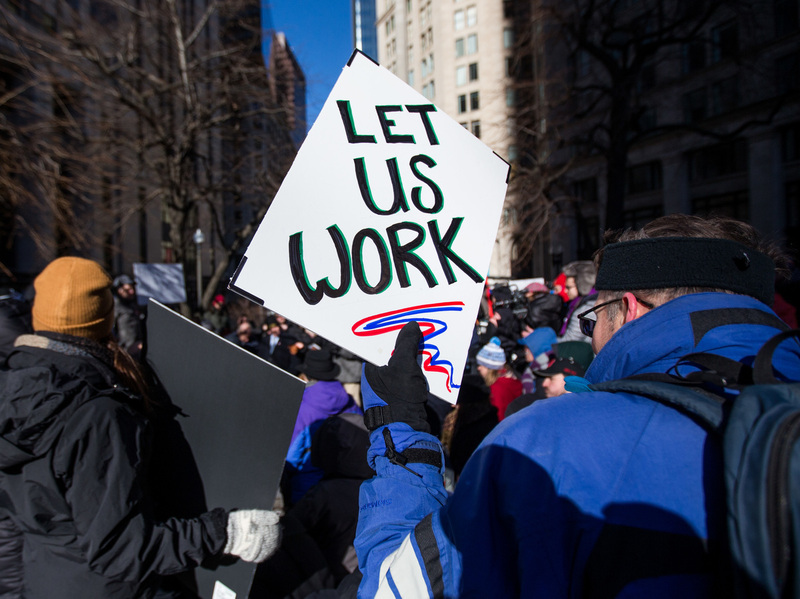 The shutdown is the longest in U.S. history and has had wide effects on thousands of workers. Admiral Karl Schultz, Commandant of the U.S. Coast Guard, tweeted, "To the best of my knowledge, this marks the first time in our Nation's history that servicemembers in a U.S. Armed Force have not been paid during a lapse in appropriations." He published a letter to Coast Guard members sharing news that USAA had donated $15 million to the Coast Guard Mutual Assistance program. Federal workers have resorted to visiting food banks and taking second jobs to pay their rent, mortgage, childcare and other financial obligations. The Guardian's Jamiles Lartey tells NPR's All Things Considered the shutdown is having an outsized effect on black workers. African-Americans rely on the wages and job security of government work that they historically struggled to find in the private sector, she says. Black-owned firms are also more likely to work with federal contracts, which will not receive back pay. Attorney O'Duden says he hopes the next court hearing will make progress in releasing 400,000 excepted federal employees from their obligations to work without pay. "There was no victory today," O'Duden concedes. "I think this is part of a process. And our fight goes on." Previous lawsuits to get back pay and damages from the government have taken years to resolve. Attorney Heidi Burakiewicz represents two people working at the Federal Bureau of Prisons who are also suing the government over this year's shutdown. She tells All Things Considered that it took four years to win a lawsuit she filed on behalf of federal workers during the 2013 shutdown.